This was a very quick moment I found to take a photo, without the crowds, which were definitely at South Shore Center this last Saturday afternoon. 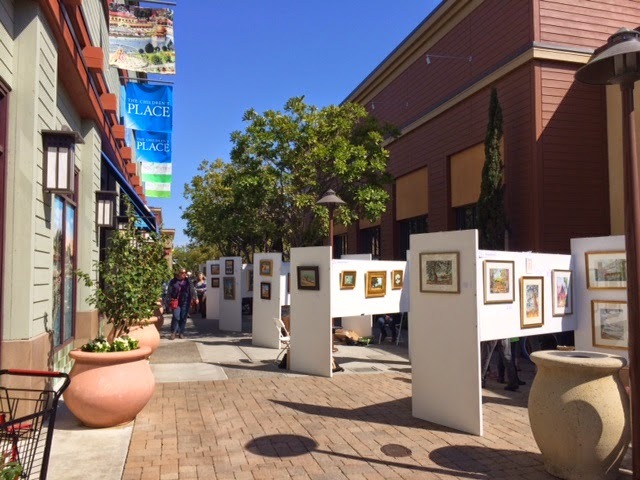 The Plein Air Artists were painting and showing all of Alameda all of the time…selling their paintings that they created in the last 5 days. It made me smile…lots! I’ve purchased two of the artists’ works in previous years. Fantastic! Boomer-chick-musings.com does anybody see the world the way I do? Maybe not so much…. The last of the three Concerts at the Cove is tonight, Friday evening. Click the link and I’ll see you there! Alameda Real Estate this Week…. Broker Tour Tues 11 new on the market, and I saw 8 of them via bike! More than may meet the eye…. single family, yes, and it seems very nice…could it be a duplex? Cute Charming…. this is a really unique duplex…built that way in 1925, on a corner edging the Gold Coast. I remember when it was sold about 20 years ago, by a colleague. Two distinct architectural styles both complementing the period. Get me a make-over Showed it once it hit the market…smack in the middle of the Gold Coast and priced like it…but is a very small place around mega homes. I was honored to give a referral today, to somebody who says he is a fan of the blog! One never knows who is reading! Kind of neat! Previous Post Previous post: How Was It Measured?